The IJ Bash Environment is a packaging of part of the way I set up my own bash + xterm environment in Linux. There isn't much code to it, but a little script code can go a long way, and it appears to be sufficiently original to be worth sharing. If you're the system administrator, you can of course put it somewhere like /etc/. Now a brief run-through of what it does. First, it keeps a record of all directory changes, allowing you to quickly change to previous working directories with the help of ijmenu. Above, 'd' is aliased to the function ij_rd. Note that it doesn't matter what command is used to effect the directory change - whether it be an ordinary cd, an alias or anything else. The prompt string (bash's PS1) may look strange. It is chosen to allow easy copying and pasting of commands: if you copy a whole line using a mouse triple-click and paste it to repeat the command then the prompt will be ignored by bash - since ':' is a shell builtin command that does nothing, and what follows it, up to the terminating ';', are treated as its arguments. This is especially useful if you want to copy a command to paste into another terminal, or if you want to copy a series of commands: provided they are not separated by output, you can repeat all the commands by doing a single block copy and paste. To preserve the prompts on command lines, use "fts -p". Note the extra comments: any command which changes the working directory is highlighted with an extra "## cd ..." so that it's easy to see the directories in which the commands were executed. In fact the directory change mechanism, as currently implemented, gets the directory history from this annotated history output. In addition to the above, there are functions to save and restore (replay) the working directory history. See the contents of ij.bash for these. There are some limitations. 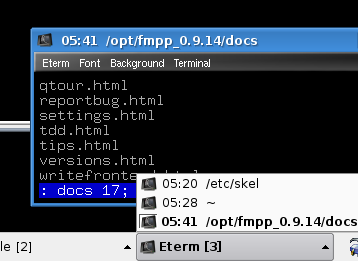 For example, it is assumed that directory names don't have spaces in them (mine don't), and the "fts" function does not attempt to distinguish the second and subsequent lines of multiline commands from the output of those commands (with an effectively empty PS2 prompt, that would be difficult to do). For me, these issues aren't significant. Directory changing: Though some swear by Ctrl-R, there seems to be a general consensus that bash's built-in mechanisms for remembering and changing directories are inadequate, and many Linux/Unix shell users have come up with their own approaches to correcting this. Two tools based on the idea of bookmarking directories are Stijn van Dongen's Apparix, one of the more sophisticated alternatives, and cdargs, which additionally provides a full-screen directory browser. Even if you're a bookmarking kind of person, the simple directory-changing functionality described here is to some extent complementary, insofar as it allows you to swap very rapidly within a group of directories you happen to be working in right now without bookmarks or aliases. History: the annotation of bash's command history to show changes in the working directory is based on Dennis Williamson's solution to a problem posed by Lajos Nagy. Prompts: Though I haven't seen anyone using the truly empty prompt (above, that's the one I called a "colour splash prompt"), the idea of a PS1 prompt that makes for easy triple-click copy and pasting is relatively well known – see the Bash Prompt HOWTO).